An Israeli drone fired, on Thursday evening, a missile at Palestinians east of Gaza city, wounding one, while the soldiers shot six Palestinians, east of Deir al-Balah, in central Gaza. Medical sources said one Palestinian suffered a moderate injury, after an Israeli military drone fired a missile at several young men, near the perimeter fence, east of Gaza city. The sources added that the soldiers fired a barrage of live rounds at dozens of Palestinians, who approached the perimeter fence, east of Deir al-Balah, wounding six, before they were rushed to Al-Aqsa Hospital. 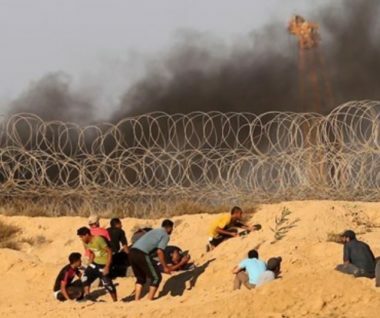 Media sources in Gaza said many Palestinians managed to reach the fence in several areas along the eastern part of the coastal region, and launched fireworks at the soldiers, who fired many live rounds. The protesters also burnt tires, and released flammable balloons, while the military pushed more troops and armored vehicles along the eastern parts of the Gaza Strip.